I was not supposed to have a birth month giveaway (not birthday cause it'll last the whole month) this year because I failed to look for sponsors. Fortunately, several brands that I have previously worked with decided to host a giveaway in my blog just in time for my birthday (which is today!). Hence, I'll be having a birth month giveaway after all. I hope you don't mind being bombarded with giveaways. Here's the first one c/o Cichic.com. Cichic.com is an online store based in China. They offer fashionable, affordable, and chic tops, dresses, bottoms, and accessories. They ship worldwide so anyone from around the world can buy their products! :) See my outfit posts featuring their items HERE! 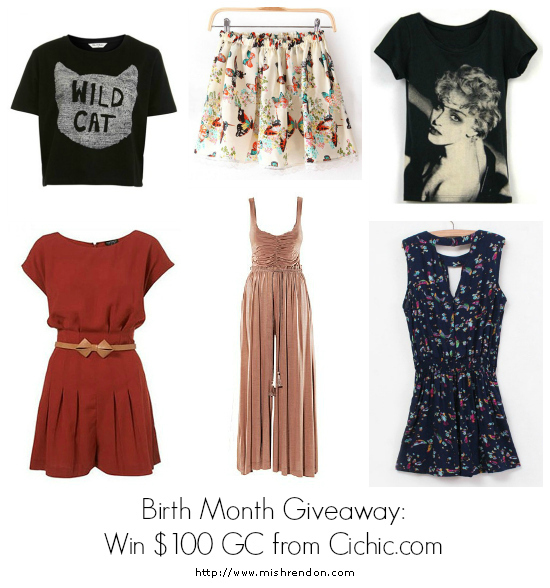 PS, Don't forget to join my $10 cash giveaway HERE! I really love the Pink Ruffle Top Fascia Floor Length Chiffon Dress! I like the Punk Golden Square Dangle Earring NaturalHairLatina(@)yahoo.com. hoping to win and Happy birthday!! there are so many beautiful apparels that i like but i surely want this one http://www.cichic.com/white-belt-collarless-seven-s-sleeve-lace-dress.html a must have! I want to win this sweater (http://www.cichic.com/sapphire-blue-gradient-batwing-long-sleeve-wool-sweater.html) and this dress (http://www.cichic.com/milky-white-embroidery-cascading-ruffle-belt-lace-dress.html).